Hans Hofmann: "The California Exhibitions, 1931"
Hofmann, who moved to the U.S. permanently in 1933 to open his school on Madison Avenue in New York City, is best known now as a painter, and one of the most important figures of American Abstract Expressionism, but from 1915 through the 1930s, drawing was his nearly exclusive form of artistic expression. Hans Hofmann: The California Exhibitions, 1931 offers an opportunity to see Hofmann's drawings again, and to assess what Ryder saw as the solutions of modern art. 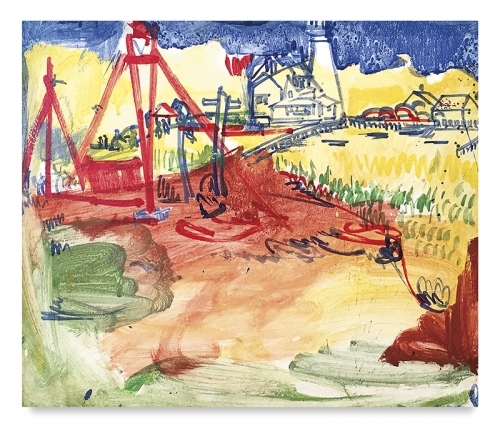 The thirty works exhibited at Hunter College's Leubsdorf Gallery were among the works included in the San Francisco and Berkeley shows: portraits and landscapes completed in Munich and Saint-Tropez in the late 1920s, and in California in 1930 and 1931, as Hofmann discovered the San Francisco Bay Area landscape. Hans Hofmann: The California Exhibitions, 1931 is organized by Hunter College MA Art History students and Hofmann Research Fellows Mindy Friedman, Chika Jenkins, and Anna Tome, with Howard Singerman, professor and Phyllis and Joseph Caroff Chair of the Department of Art and Art History at Hunter College. The exhibition and catalogue are supported by a generous grant from The Renate, Hans, and Maria Hofmann Trust.